On a cold, wet day when there is no possibility of skiing , we decided it was a perfect day to go to the movies. Wanaka’s local, Cinema Paradiso is fun to visit as well as showing a great selection of films. In the school holidays, the latest kids movie is always playing. For the adults, we like the “Art House” flavour of the choices. There is always something on we would like to see but haven’t got around to in Auckland. The cafe food is excellent if you want to have a meal before the film, in a relaxed fashion. Half time though is the food high point; massive, delicious biscuits still warm from the oven. And for those whom a movie is never complete without an icecream, quality Rush Munroe icecream is for sale. 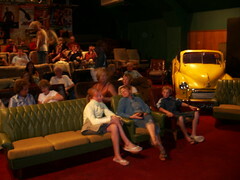 The kids always want to sit in the old Morris Minor that sits inside the theatre. We like cuddling up on the old sofas. On a wet Sunday afternoon, it was excellent that you can book in advance. A number of parents in Wanaka had the same idea as us so the smug feeling that comes with knowing you already have tickets while those in the queue wondered, was certainly worth a call!